Hello, gentle readers, and welcome to the RPG Reload, the weekly feature where we need food badly. Each week, we dig into the archives to find an RPG from times past, all just for the little old purpose of seeing how it holds up today. It’s a bit of reflection, a little revisiting, and a chance to dive deeper on a game than our usual reviews allow. As ever, I try to present a sensible spread of titles to represent this vast genre from week to week, but if you think I’m missing something cool, please let me know. You can make suggestions by commenting down below, posting in the Official RPG Reload Club thread in the forums, or by tweeting me at @RPGReload. We’ve only got one last regular reader’s choice article coming up in August before starting the new format, so if there’s something you want to see soon, let me know now. I’ve covered a few roguelike games in this feature already, and I’ll certainly be covering others in the future. As we close in on the end of the first year of this column, I thought it might be a good idea to go back to the earliest example of the genre available on iOS. 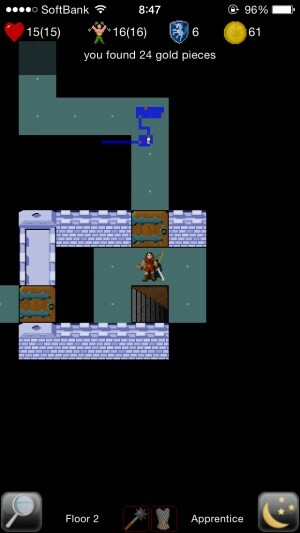 Though it might seem odd, Rogue is not the first roguelike game. That honor goes to Beneath Apple Manor, a 1978 Apple II release. That said, as the genre isn’t referred to as beneathapplemanorlikes, it’s clear that Rogue had more of an impact in the greater scheme of things. That might have been circumstance, or it could have been the few significant things Rogue does differently from Beneath Apple Manor. The games were apparently developed without knowledge of one another, however, so I’ll leave further Beneath Apple Manor talk for if and when it shows up on the App Store. That the name of the genre is still roguelike here in 2015 shows how big of a presence Rogue held in the category for so many years. We don’t call Destiny a Doom ($4.99) clone, and even falling block puzzlers managed to shake off Tetris ($1.99)’s attachment. A great deal of why that is can be found in the game’s roots. Initially developed by Michael Toy and Glen Wichman, with Ken Arnold and Jon Lane later joining the official team, it was the result of a pretty common motivation for game designers in the early days of gaming: the developers wanted to make a game that would be fun for they themselves to play. Toy and Wichman were big fans of both the 1976 text adventure Colossal Cave Adventure and Dungeons & Dragons. A new programming library for UNIX called curses allowed programmers to place text anywhere on the screen, and the two young men thought they could use that to make a graphical adventure game of their own. Most (though not all) of the adventure games and RPGs released before Rogue had a bit of a flaw for the developer who wanted to enjoy playing their own games. Namely, once you knew the answers to all the puzzles and where to go on each map, the games became a lot less fun to experience. 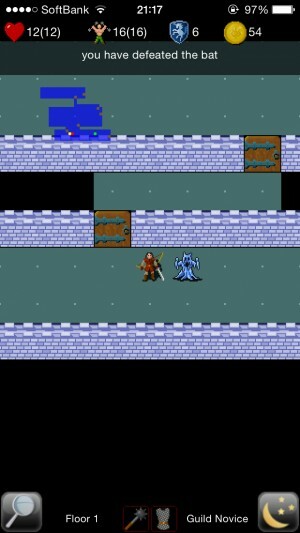 Toy and Wichman decided their game would have randomly-generated maps, items, and monsters, ensuring a different experience every time you play. That went all the way down to the items, whose effects were a mystery until you used them or found a way to identify them. If that didn’t make things tricky enough, Rogue followed in the footsteps of many early computer games in that death was permanent. The latter point is the main thing that separates it from Beneath Apple Manor. Rogue was very, very hard. However, if things lined up nicely for you, it wasn’t a terribly long game from start to finish. All you have to do is make your way down to the bottom level, grab the Amulet of Yendor, and climb back out. Easy-peasy! Rogue was created for the UNIX operating system, used by many universities at the time. UNIX labs were intended for educational purposes, but that didn’t stop students from making and playing games anyway. Toy and Lichman hammered out the basics of the game before Toy transferred from U.C. Santa Cruz to U.C. Berkeley. There, he continued work on the game with Ken Arnold, who had been responsible for the curses library that made the game possible in the first place. This may have been one of the circumstances that allowed the game to catch on the way it did. Berkeley was the source of the very popular BSD UNIX, and Rogue somehow ended up packaged in with version 4.2 of the software. As a result, Rogue was shared around university campuses pretty freely, and since the source code was open, anyone could make a fork and tweak the game as they saw fit. This resulted in near endless variations of the code that collectively became known as ‘roguelikes’. The game proved tremendously popular, with the legendary computer scientist Dennis Ritchie remarking at one time that Rogue “wasted more CPU time than anything in history". After finishing university, Toy met up with Jon Lane, and the two of them decided to start a company called A.I. Design. They mostly just made ports of Rogue to various platforms, with IBM PC and Mac being the first ones on the list. They eventually hooked up with early computer software publisher Epyx, who helped them market the game. In spite of, or perhaps because of, its popularity on college campuses, the game never really went anywhere commercially. By this time, it was 1984, and humble old Rogue in all its ASCII glory was sitting at full-price on the shelf next to things like Ultima 3. The Amiga and Atari ST versions of Rogue would replace the symbols with sprites, but by the time those came around, we had things like The Bard’s Tale ($2.99) and Might & Magic. That’s not to say that people weren’t playing it. They very likely were, but they probably didn’t feel like paying full price for it after it had been free for so long. That’s not even mentioning Rogue‘s spawn, as Hack and Moria were out and capturing people’s attention with their more advanced rulesets. While its original creators seem to have not gotten their financial due for Rogue, the game itself would eventually have its day once more. With the massive spike in popularity the genre has enjoyed in the last decade or so, Rogue‘s profile has increased to the point where it sits comfortably with other important genre-defining games, a spot it more than deserves to occupy. Oh, to be sure, it’s not likely the roguelike of choice for many genre fans these days, having passed the torch long ago to games like Nethack and Angband, but it’s perhaps never been so well-known as it is today. You can’t swing a dead kobold without hitting one of Rogue‘s progeny. And unlike many other historically important RPGs, Rogue isn’t owned by anyone in particular, so anyone can make it available on any platform. These days you can play the game almost anywhere. Heck, right now you can find at least two versions of the game on the App Store. The first version, simply titled Rogue ($1.99), released in November of 2008, and hasn’t seen a single update since. The other, coming only a few months later, was titled Rogue Touch ($2.99). It has seen many updates and is the subject of today’s article. Rogue Touch comes from developer Kevin Hill and his company Chronosoft, who built the game from scratch as a learning experience. He chose to develop Rogue Touch based on his happy memories of playing the Atari ST version of the original. Rogue Touch isn’t afraid to rethink the way certain things work to make a better play experience, however. Sensible and easy-to-use controls fill in for keyboard controls, there are some new magical items that can convey new effects to your gear, the list of monsters has a couple of new additions, and there are even a bunch of secret characters to find. It’s also a bit more lenient, being more generous with food, improving the chances of the search command succeeding, and so on. At its core, though, it’s just plain old Rogue, ready to fire up and play anytime you need it. I don’t know about you, friends, but I don’t need much more from a Rogue release than that. You start the game by naming your hero. Don’t get attached. 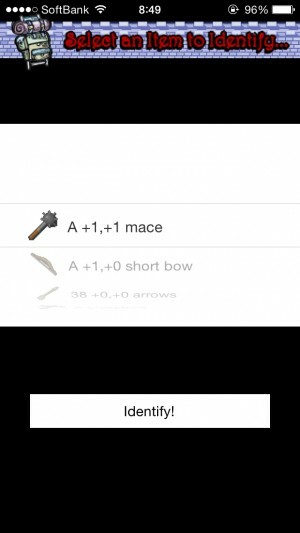 Depending on the name you chose, you’ll start with different inventory and stats. Some of the game’s interesting secrets are hidden here, with certain names giving you special results. Whatever name you choose, you’ll head into the dungeon’s first floor immediately. Your main goal is to find the stairs on each floor, with the aim of descending to the 26th floor where the Amulet of Yendor awaits. Once you’ve got it, you just have to bring it back up. That’s one of the few ways Rogue Touch is harder than the original, actually. The hard part of the original was in reaching the Amulet, with ascending being pretty easy. Here, things get tougher in the home stretch, which helps address the anti-climactic feeling of the original game. Of course, while getting to the Amulet is easily described as descending two dozen or so staircases, actually doing it is pretty hard. It’s vital to balance hanging around a floor leveling up with moving forward in search of new items and food. If you descend too quickly, you won’t be strong enough to survive encounters with enemies. Go too slowly, and you’ll likely starve to death. This same kind of risk vs. reward set-up can be found with the items. You’ll find potions, scrolls, rings, and so on laying around, but you’ll have no idea what any of them do until you either use them or identify them. There’s a good chance they’ll do harm to you, but you won’t be able to make it to the bottom without the positive effects they could grant. Use them when you’re in a place safe enough to recover, or save them for a pinch and hope for a miracle, it’s up to you. Since they’ll change with every new game, it won’t do you much good to keep track of what does what. Instead, focus your memory on the enemies. One of the keys to survival is in learning how to handle each enemy and their particular behaviors. For example, if you see an Aquator or a Rattlesnake, throw everything you’ve got at them to avoid their touch. This is a tough game, but particularly in this form, Rogue is not quite as tough as some of its successors. It’s also nowhere near as easy as many modern roguelikes that try to hit a broader audience. You’ll start off losing most of the time. Eventually you’ll win, and after that it’ll happen more and more often. Even after you clear the game, you can always try for a higher score or just take another trip to enjoy going through a different dungeon layout. Rogue is still a fun challenge even in 2015, and when you consider its vintage, that’s truly astounding. Other than a few tweaks and a set of sprites, this game is 35 years old. More RPGs have released on iOS this month than the total number in history released prior to Rogue, and people still play it and enjoy it today. Rogue Touch is a pretty good way to play it, too. The interface isn’t perfect, but it’s surprisingly easy to play given what needed to be packed in. Updates have, in addition to adding new content, ensured the app has stayed up to date with most major upgrades to iOS and accompanying iPhone hardware. Retina display, multitasking, and iPhone 5 family screen size support were all added as things moved along, and as a result of this hard work, the game seems like it was built recently rather than six years ago. Sadly, it’s an iPhone-only app, but it looks and plays decently on an iPad, so you can still take a go at it on your tablet if you like. The developer is working on other projects now, so it’s hard to say if Rogue Touch will get any further updates beyond fixing it if it breaks, but you never know. In brief, Rogue is a game that has persisted longer than almost any other, and was so utterly instrumental in shaping the genre during its quiet decades that by the time other roguelike games started to get away from it completely, the genre name was well and truly stuck. It’s simple to pick up the basic rules of play, aggravatingly tough to beat, and extremely hard to put down until you do. There’s a reason other roguelike games don’t wander off far from its core tenets, and Rogue Touch is a fine way to experience this monumental RPG. That’s just my take on Rogue Touch, though. What do you think? 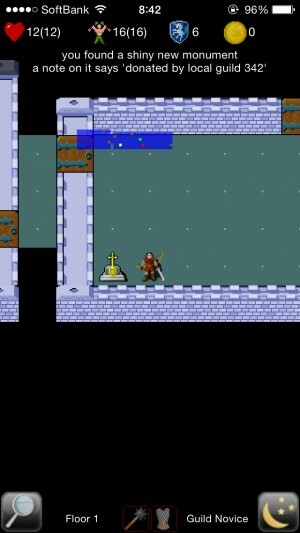 Is it still worth playing with all the other great roguelikes on iOS? I want to hear what you all think, so please leave your comments below, post in the Official RPG Reload Club thread, or tweet me at @RPGReload. Also, don’t forget to send in any questions you’d like answered on the August RPG Reload Podcast to rpgreloadpodcast@gmail.com. The topic of that show will be Final Fantasy 5 ($14.99), but you can ask us any old thing you’d like. As for me, I’ll be back next week with another well-known and influential RPG. Thanks for reading!